Located in Midtown AtlanTa, Pasta da pulcinella is a cozy venue with cuisine that is unmatched in quality. Whether it's a romantic evening, a group outing, or a private event everyone can enjoy the charm of our little yellow house hidden in the shadow of skyscrapers. Pulcinella originated as a character in the 17th C Commedia dell’ Arte and is a symbol of effervescence, joviality, and unbridled imagination. Pulcinella drawings that adorn our walls, but also in the lively buzz, friendly service, and Chef Bibbiano’s imaginative menu with his signature dish: Tortelli di Mele—round ravioli filled with Granny Smith apples, sausage, and parmigiano topped with brown butter and sage. Tomatoes, fresh mozzarella, shiitake mushrooms and eggplant componata on croutons. 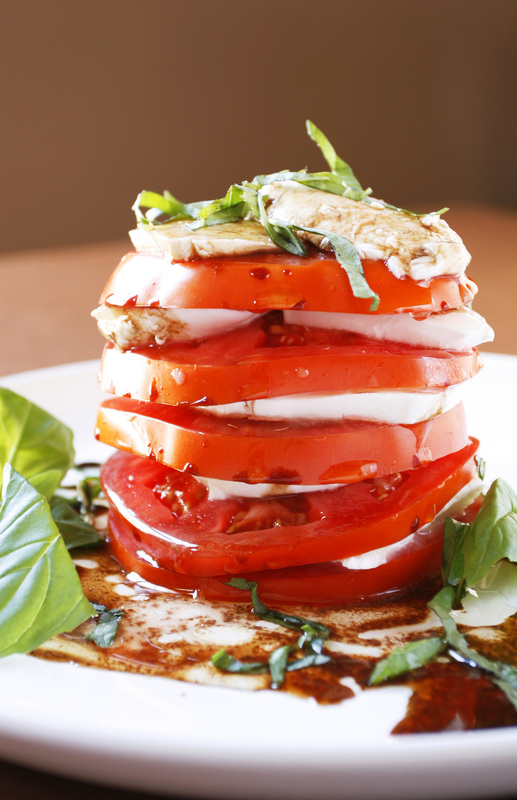 Fresh Mozzarella and tomato slices in Balsamic vinaigrette. Traditional Caesar dressing with shaved Reggiano and croutons. Mixed greens and Balsamic vinaigrette. Traditional Caesar salad with grilled chicken breast strips. Grilled zucchini, red bell peppers and Balsamic vinaigrette. House made spinach tagliatelle with a hearty ragú made with veal, beef, onions, carrots, celery, tomatoes, and a hint of cream. Round ravioli filled with Granny Smith apple, sausage, and parmigiano are topped with browned butter and sage. Wild mushroom stuffed ravioli with brown garlic, shiitake and domestic mushrooms tossed in rosemary infused olive oil topped with tomatoes and julienne zucchini (vegetarian). Stuffed with wild mushrooms served in a spicy tomato cream sauce. Eggplant, bell pepper, walnuts, ricotta, parmesan, basil and mint topped with a tomato basil sauce (vegetarian). Buckwheat tagliatelle tossed with sautéed broccoli rabe, roasted radicchio, browned garlic, shiitake mushrooms and crushed red peppers (vegetarian). with a choice of tomato sauce, basil pesto, or garlic cream sauce. Yellow squash, zucchini, red bell pepper, and mushrooms. With basil pesto and a Caesar salad. Grilled zucchini, red bell peppers, squash, and eggplant. Fresh tomatoes and Fontina cheese served with a Caesar salad. Breaded chicken scaloppini, field greens, tomatoes, red onions, and caper butter sauce. With semolina gnocchi discs in white wine tomato basil broth. Sautéed chicken breast wrapped in prosciutto, marsala mushroom sauce and penne al pesto. With lemon vinaigrette, pine nuts, and goat cheese. Buckwheat tagliatelle tossed with sautéed broccolirabe, roasted radicchio, browned garlic, shiitake mushrooms and crushed red peppers (vegetarian). Italian crepes stuffed with chicken, spinach and ricotta topped with tomato basil sauce and a Gorgonzola mushroom sauce. Ravioli stuffed with lobster and ricotta in a Champagne cream sauce topped with basil and fresh tomatoes. Red bell peppers, broccoli rabe, toasted pine nuts and basil olive oil. served with field greens and balsamic vinaigrette. fresh mozzarella, garlic Aioli & tomatoes. coated in egg white breading, served with tomato caper sauce. sun dried tomatoes and toasted walnuts in a basil pesto cream sauce. with grilled chicken, green onions, diced tomatoes tossed in rosemary garlic oil. breast with zucchini, broccoli rabe, sundried tomatoes and gorgonzola mushroom sauce. All coffees are made to order. For information about private events please contact Tana Jo, Event Manager, at (404) 876-1114 or email pastadapulcinella@yahoo.com. Pasta da Pulcinella offers special event menus for a memorable night, including Holidays, Rehearsal Dinners, and Catering. For the various menu options please visit our Special Occasion section. Please ask your server about taking your remaining wine with you. Call (404) 876–1114, or book online with OpenTable. Reservations appreciated for large parties. Event Manager, at (404) 876-1114 or email pastadapulcinella@yahoo.com. Nothing says caring more than a delicious meal, and what better way to deliver it than with a gift card to your favorite restaurant. Metered and paid parking available across the street and on 12th street. Since 1994, Pasta Da Pulcinella has been a place of the reknown Zagat Survey, Frommer’s Guide to Atlanta, and a host to nation-wide clientele. In 2000, the restaurant moved off Peachtree street in favor of a more intimate atmosphere. Pasta Da Pulcinella has undergone changes but has maintained the classic appeal that made it famous. Table linens, oil paintings of Tuscany, classic melodies, and the scent of fresh pasta fill the air. Chef Bibbiano has been the heart of Pasta Da Pulcinella for over fifteen years. He diligently maintains the restaurant’s original menu, all the while creating additional dishes each week with the freshest ingredients. Unassuming and quick with a smile, Chef Bibbiano keeps his small kitchen full of laughter and the joy he gets from his work.